We help Cats & Dogs, to relocate across the globe; our base being in Gurgaon, India. Let us know where you’re heading & we will assist you to relocate your pet with comfort, care and ease. Your furry friends can now follow you wherever you go. Currently PetSpot handles pet cats and dogs. Our services help the pet/s to travel from other countries into India (In-Bound Travel) and from India to any other country (Out-Bound Travel). We also undertake domestic projects to assist pet parents who travel with their pets within India and these are called ‘Domestic pet relocation/ Travel’. PetSpot started pet relocation services in 2015, and in last 3 years we have helped more than 200 pet parents to comfortably travel with their pets both, Internationally and domestically. PetSpot team have the experience and expertise of enabling pets travel from/to almost 20 different countries and the most frequent ones being: Australia, Canada, United Kingdom, United States of America, Dubai, Germany, France, Belgium, Pakistan, Indonesia, Malaysia, Singapore, Dubai, Vietnam, Madagascar, Africa, Korea, China, Philippines, Japan, Switzerland, Hungary, Austria, Netherlands, Finland, Cambodia, South Africa & Mauritius – to name a few. Every country has different rules for incoming and outgoing pets. Some countries require only the certified paper work. Some countries require the pet to go through quarantine. Depending on the Country norms and the Import Customs, they will have very different laws, unique to each country. Some countries have laws related to import and commercial import of pets. In India you cannot import a pets however it is allowed to bring in your own pet as a companion, but with certain mandated clauses. PetSpot Founder Vizal Atheya, has travelled with pets to relocate them to different countries and ease them in. She understands procedures and processes of different countries regarding pet relocation at a first-hand information. 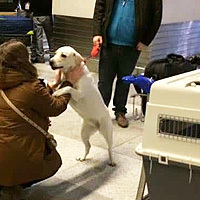 PetSpot Team have built the relationships with agents, veterinarians, quarantine offices, cargo offices, airlines across many countries, through their years of service and experiences. All other types of documentation for travel as per the country’s requirements including: health certificates, import permit, export permit etc. Our aim is to help cats and dogs of all breeds to move anywhere, where their owners go. Our base being in Gurgaon, India, does not restrict our services – both in and out bound.